FIGURE 15 Schematic diagram of three states of the Na+ channel: (A) rest; (B) peak gNa; and (C) inactivated. spontaneously decays. If Na+ permeability decays, because of inactivation, the potential would move closer to EK or, stated in a slightly different way, it will become less depolarized. Depolarization would be reduced, and the reduction in depolarization would produce a further reduction in Na+ permeability (i.e., deactivation) because of the basic relationship between voltage and Na+ permeability (Fig. 9A). As a result, a new feedback cycle is initiated that would tend to repolarize the cell. It is therefore intriguing to think that simply by accounting for (1) the voltage-dependent increase in Na+ permeability and (2) the process of Na+ inactiva-tion, both the initiation and the repolarization phases of the action potential could be explained fully. However, there are at least two problems with this hypothesis. 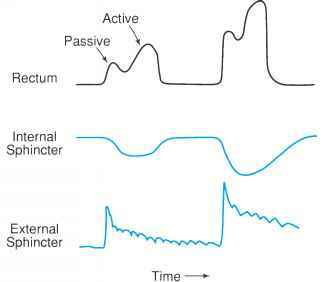 First, the duration of the action potential is only about 1 msec, yet the Na+ permeability change takes 4 msec or so to return to the resting level (fully inactivated). So, by extrapolating these voltage-clamp measurements, one might expect that the action potential would be somewhat longer in duration than 1 msec. Second, it is difficult to explain the hyperpolarizing afterpotential. From the voltage-clamp data (Fig. 11), it is clear that Na+ permeability increases dramatically and then inactivates. To explain the hyperpolarizing afterpotential, Na+ permeability would have to be less than its initial value (a would have to be less than 0.01). So, based on the observed changes in Na+ permeability, it would be impossible to account for the hyperpolarizing afterpotential.